This space shifter invokes the mystical realms of Avalon--a true transmission from the Otherworld. 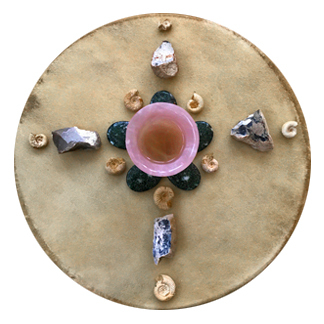 The Wheel of Time, the healing water from the Chalice Well and the mighty medicine of the Rose are within this sacred medicine. As the spiral of the Ammonite Shell unwinds, what is captured in your past is set free. Ammonite allows you to come full circle, finding your essence. This stone is found all over Glastonbury. Glastonbury Flint is also native to the land of Avalon and is deeply grounding. Presili Bluestone attunes one to Stonehenge and the Presili Mountains in Wales. Personal healing, ancestral healing and planetary healing transpire as you are invited into the womb of all time. Ingredients: Essences of Ammonite Shell, Glastonbury Flint, Presili Bluestone, Clear Quartz Capture of Glastonbury and Chalice Well Wheel of Life. 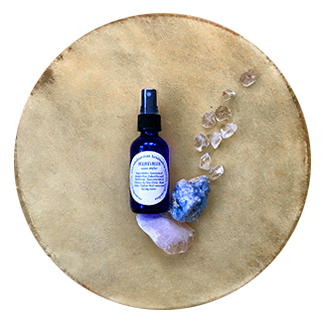 Essential Oil Avalon Mist by Star Child. Rosewater, Chalice Well Water and Spring Water in 2 oz blue bottle. Instructions: Spray as the Spirit calls around your body. These 2 oz bottles are perfect for uplifting any space around your aura. This facial mist goes beautifully with the Quartz Cleansing Dust and Angel Wings Beauty Cream. 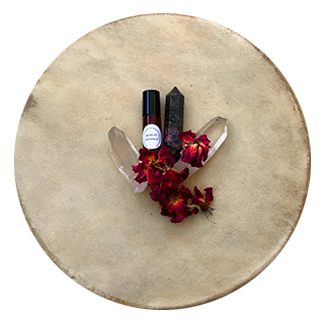 This mist is pure alchemy as it combines the essences of Lepidolite, Danburite, Pink Calcite, Rose Quartz and Rose Petals with Chalice Well Water and Rose Water. A splash of Rose Flower extract preserves the magic and a few drops of Egyptian Rose essential oil adds a lovely scent. Spray this liberally to your face and skin. Rose’s Mist also makes a wonderful aura spray and spacial smudge. 2 oz blue glass bottle. Ingredients: Essence of Lepidolite, Danburite, Pink Calcite, Rose Quartz and Rose Petals. Extract of Rose Flower in Organic Grape Alcohol. Chalice Well Water, Rose Water, Spring Water and Egyptian Rose Essential Oil.